God forbid he lets the polishing secret out! The first turn on a twisty trail and it would be the end of the ride. That thing is so big it's ridiculous. Great to take 6 people golfing I guess. I hope the 1000 means it's displacement because that's the bare minimum to move it. The 1000 was referring to the sport side by side. The new Viking models apparently still get the 700cc engine. The only changes are cosmetic. 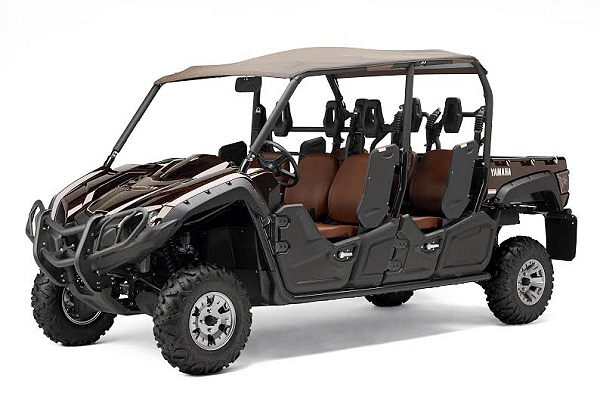 The 6 passenger model is for people who want to haul around all their kids and grandkids. Most of them will never be used on any serious trail. It probably is more capable than most think but its huge. Even with power steering, it would need a lot of room to manuver. On a nice, wide trail, no problem. On a tighter trail, reverse would be used a lot. I hope it has some good factory skidplates because they'll get tested too, constantly scraping on everything. The extra weight just puts more on an already modestly powered engine. It doesn't even get the new 708cc engine, it still has the 686cc engine. It was a great engine in the Grizzly and a good base engine for the Viking but this class demands a more powerful option for the top of the line model.